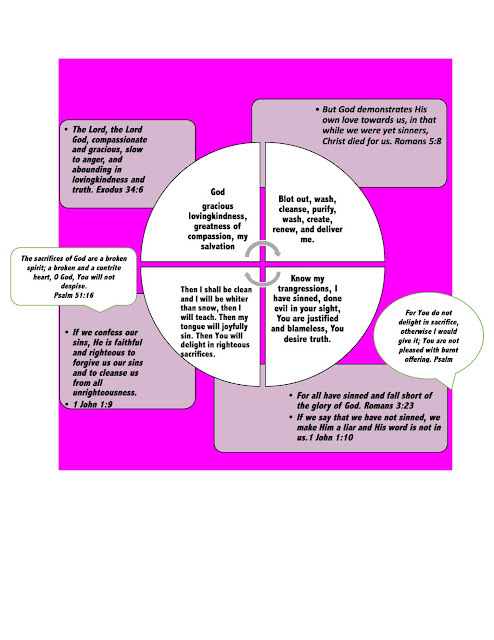 Hopefully, when you look at these two diagrams below, you recognize salvation is what Jesus did and not about what you can do? God wants remorse from the heart, not some weird performance. Trying to act out your faith is only going to exhaust you and confuse others. Please pay attention to the fourth green box highlighted. You are justified is such an important statement because many are trying to overlook sinful behaviors and declare themselves right in the eyes of God. If you believe that God is going to accept your lifestyle, you are wrong. There is nothing Biblical about that claim. Read Psalm 51 over and over again, digesting what God’s word is saying. If you don’t get it, tell that to God and ask for His wisdom to understand. Only the Holy Spirit can move man’s, heart. Ask, Seek, Knock! Don’t stop ASKing till God answers. Be gracious to me, O God, according to Your lovingkindness; according to the greatness of Your compassion blot out my transgressions. Wash me thoroughly from my iniquity and cleanse me from my sin. For I know my transgressions, and my sin is ever before me. Against You, You only, I have sinned and done what is evil in Your sight, so that You are justified when You speak and blameless when You judge. Behold, I was brought forth in iniquity, and in sin my mother conceived me. Behold, You desire truth in the innermost being, and in the hidden part You will make me know wisdom. Purify me with hyssop, and I shall be clean; Wash me, and I shall be whiter than snow. Make me to hear joy and gladness, let the bones which You have broken rejoice. Hide Your face from my sins and blot out all my iniquities. Create in me a clean heart, O God and renew a steadfast spirit within me. Do not cast me away from Your presence and do not take Your Holy Spirit from me. Restore to me the joy of Your salvation and sustain me with a willing spirit. Then I will teach transgressors Your ways, and sinners will be converted to You. Deliver me from bloodguiltiness, O God, the God of my salvation; Then my tongue will joyfully sing of Your righteousness O Lord, open my lips, that my mouth may declare Your praise. For you do not delight in sacrifice, otherwise I would give it; You are not pleased with burnt offering. The sacrifices of God are a broken spirit; a broken and a contrite heart, O God, You will not despise. By Your favor do good to Zion; build the walls of Jerusalem. Then You will delight in righteous sacrifices, in burnt offering and whole burnt offering; Then young bulls will be offered on Your alter.